The EMAS 2014 spring Study Tour is to the Île de France and Picardy regions. 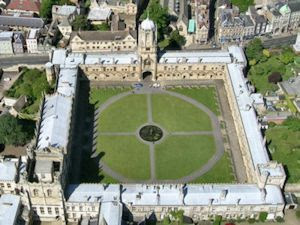 This is an area with many interesting archaeological sites, particularly from the medieval period. We will be based in Amiens - a very interesting town with a truly wonderful cathedral - which is the perfect centre from which to explore the region. Our itinerary will include some of the most impressive later medieval architecture, with cathedrals such as Beauvais, Laon and Senlis. In addition, we will visit two of the most important early medieval sites in the area - the Carolingian Bas Œuvre at Beauvais and the Merovingian crypt at Jouarre , which is one of the oldest religious structures in France. We will also visit the site of the battle of Crécy, viewing the site from the place where Edward III directed the battle; the important Roman site of Bagacum at Bavay, and some impressive castles. The cost will be £785 per person for people sharing a twin room and £895 for a single room. The early fifth century transition from Roman Britain to Anglo-Saxon England is a poorly understood period in British history. Historical narratives describe a brutal conquest by Anglo-Saxon invaders with nearly complete replacement of the indigenous population, but aspects of the archaeological record contradict this interpretation leading to competing hypotheses. A new study, published in the Journal of Archaeological Science, suggests a more peaceful process, according to Dr Andrew Millard, from Durham University, one of the paper’s lead authors. ‘The main controversy over the years has centred on how many Anglo-Saxons came across the North Sea,‘ he says, ‘Was it a mass invasion, where the existing population was wiped out completely or forced back into Wales, or was it a small band of elites whose ways were then adopted very quickly?’ The evidence the researchers have gathered favours the second option. An early Saxon man who fell on his shield has been found buried with a knife and spear alongside a jewellery-clad woman during a dig on a residential site in a Cambridgeshire village. Grave goods, weaponry and everyday items from the 6th century surfaced during the excavation in Haddenham, where similar remains – including a double burial of a man and a woman – were first identified more than 20 years ago. Two seasons of non-invasive investigation including geophysics and aerial prospection have succeeded in providing new insight into the 15th century Polish settlement of Nieszawa – a town which rapidly developed into an economic rival to Teutonic Order controlled Toruń (Thorn) just across the Vistula river. Archaeologists P. Wroniecki, M. Jaworski, M. Pisz, S. Rzeźnik and W. Stępień completed a study of the survey results, allowing for a detailed digital reconstruction of Nieszawa as it was in the early 15th century AD. Nieszawa was once located on the opposite side of the Vistula river from the town of Toruń and was given municipal rights in 1425. Its appearance is directly connected to the construction of Dybow Castle (from 1424-1428) by the Polish king Władysław Jagiełło. The town benefited from its riverside location and developed so rapidly that within a short space of time it was in competition with Toruń. The growing income from river trade became a source of socio-economic tension between the Polish Kingdom and the Teutonic Order, and discontent grew among the townspeople and merchants of Toruń. Eventually, the people of Toruń rebelled against Teutonic rule, and in appreciation for their involvement on the Polish side during the Thirteen Years’ War (1454–66), King Casimir IV Jagiellon decreed that he would demolish Nieszawa and relocate it 32 km upstream, where it still exists to this day. A rare example of prehistoric rock art has been uncovered in the Highlands. 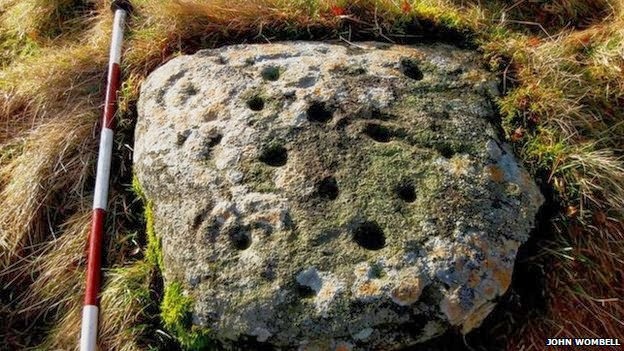 Archaeologists made the discovery while moving a boulder decorated with ancient cup and ring marks to a new location in Ross-shire. When they turned the stone over they found the same impressions on the other side of the rock. It is one of only a few decorated stones of its kind. John Wombell, of North of Scotland Archaeological Society (NOSAS), said: "This is an amazing discovery." These steps at Dutchman's Cove in Castletownsend, County Cork, Ireland, were carved out of the rock to facilitate illicit trade, in the dead of night, by pirates and smugglers. An alliance of pirates preyed on ships laden with treasure, outmatched Britain's Royal Navy, elected their own admiral and, ultimately, were destroyed in a cataclysmic battle against a Dutch fleet in 1614. They were a pirate alliance which operated on the southwest coast of Munster, Ireland, in the early 17th century, and now new archaeological and historical research reveals new details about their adventures. An important archeological find of ancient Roman ruins has been made at the Medici Fortress of Arezzo in central Italy. During work for the reorganization of the historic building, evidence of an ancient Roman structure dating from the early decades of the first century AD were brought to light - probably a residence, or domus. The new findings were presented by the regional superintendent of archaeological heritage, Andrea Pessina, who announced the continuation of work thanks to an immediate loan of 10,000 euros to identify more precisely what is there, as the structure could turn out to be an ancient public building of a much larger dimension. The Roman find is of enormous value for understanding the history of the city, Pessina said, and complements other discoveries such as the Church of San Donato in Cremona, dating back to the year 1000, found a few metres from the Roman structure, now being restored with financing in part from Prada proprietor Patrizio Bertelli. The ancient ruins are believed to be a residential building from the Roman period in which three rooms so far have been identified. Remains of painted wall and floors have been found in two partially investigate rooms. The building, located in the northeastern plateau of the San Donato hill, was perched above the hillside's the steep slopes overlooking the valley below. In the so-called "Old Cathedral" in Mainz, which is today the evangelical Church of St John, archaeologists found the remains of another church built 1,200 years ago in the time of Charlemagne, Deacon Andreas Klodt said on Tuesday. Only Trier on the Mosel River has an older church, with its cathedral dating back to Roman times, making the find the second oldest church in the country. Professor Matthias Untermann from the Institute of Art History in Heidelberg said the remains of the Carolingian walls stretched from the basement to the roof. “This is a big surprise,” he said. Scandinavians traditionally do rather well at the winter Olympics – for perhaps obvious reasons – but their Viking ancestors would have been no stranger to some of the delights of Sochi. Skis were used and valued in the North. Earl Rognvald I of Orkney boasted that (among several other skills) he could ‘glide on skis’, and the god Ullr was also associated with skiing. In fact, he has been taken as a sort of unofficial patron of the winter ski community, whose members often wear medallions depicting the god – there would no doubt have been a good number of Ullr talismans among the skiers in Sochi. And, while the bob-sleigh may have been unknown, sledges of various kinds are certainly known from Viking burials, including a particularly beautiful example that was found in the famous boat burial from Oseberg in Norway. An ice age site said to be one of the last known places Neanderthals lived is being studied to assess storm damage. La Cotte in St Brelade, Jersey, was hit by south-westerly storms including winds of up to 100mph in February. A British archaeological team commissioned by the Societe Jersiaise will examine the storm damage. Dr Matt Pope, from the Institute of Archaeology, UCL, said it needed to consider the best solution for long-term preservation. 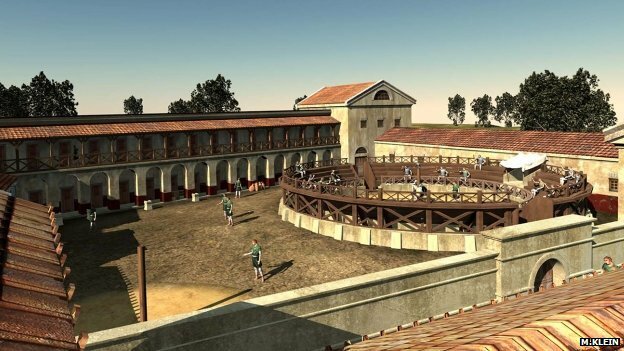 Archaeologists have made a virtual reconstruction of a Roman gladiator school discovered on the banks of the River Danube in Austria. The so-called ludus was on a scale to rival the famous ludus magnus, the gladiatorial school behind the Colosseum in Rome. 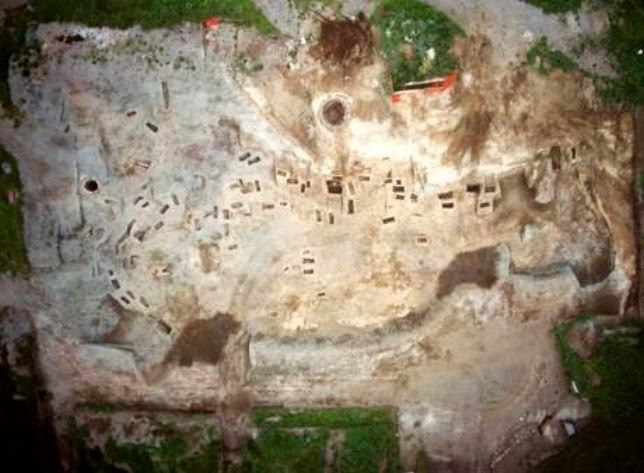 The remains at Carnuntum were mapped using sophisticated aerial surveys and ground-penetrating radar. The archaeologists published their findings in the journal Antiquity. Carnuntum was the capital of Upper Pannonia in Roman times and a major trading centre for amber. The largest, best-preserved ancient Roman funerary complex found in Italy since the 19th century has been discovered at an archeological dig 70 km northeast of Venice, researchers announced Friday. An imposing monument from the third century AD was located outside the ancient walls of what was once the Roman colony of Iulia Concordia, now in the town of Concordia Sagittaria. The site was likened to a "little, flood-plain Pompeii" in a guided tour at the restoration site in Gruaro, Veneto. Just as Pompeii was buried by the volcanic eruption of Mount Vesuvius in 79 AD, a natural disaster wiped out and preserved sarcophagi in Iulia Concordia. A new series of visual mash-ups proves that in London, history is alive in every corner. Reddit user shystone recently mashed up paintings of London from the 18th and 19th centuries with their modern-day settings in Google Street View. The results encompass several popular landmarks, including Westminster Abbey and the River Thames. Like the film rendition of "London, Then and Now," shystone’s work offers clever insight into how much (or little) London has changed. Read shystone’s knowledgeable analysis of each remix here. Excavation work has started at Carrickfergus Castle in Co Antrim, Ireland’s best preserved Anglo Norman castle, in a bid to find out more about the 800-year-old fortification. Archaeologists began test excavations at the site last week as part of the ongoing work by the Department of the Environment to uncover more of the landmark’s history and to help guide future development of the castle to improve visitor experience, the Irish Independent reports. The castle boasts a long and storied history. 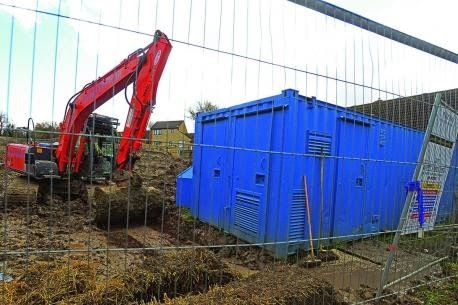 A decapitated body has been pulled out of the ground at a small housing development in Wanborough. 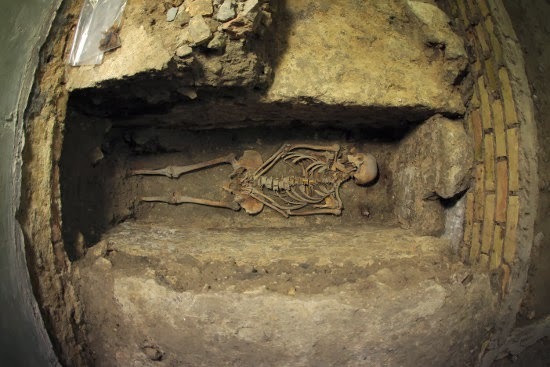 The skeleton, which was buried in a shallow grave, is thought to date back around 1,700 years, at a time when a Roman farming settlement occupied the area. Archaeologists believe the person would likely have been a criminal, executed and dumped just outside of the town. Archaeologists gained a valuable insight into life and death in Saxon England thanks to a dig in Haddenham. At the start of the month, Pre-Construct Archaeology was invited to excavate a small site in the car park of the Three Kings pub, at the heart of the village, before developers moved on and began work on a new house. And, despite the dig taking place over a small site, the dig turned up a wealth of finds, including nine burials and plenty of grave goods in what experts believe was a Saxon burial ground. Excavations at the Domskirke in Ribe, Denmark began in 2008 and analysis of the results lend new insight into early Christianity, where this may have been one of the first places in the country where a small enclave of Christians worshipped and died. 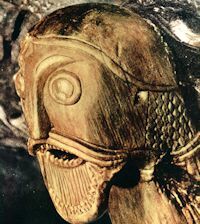 Studies have now shown that there may have been Christian Vikings in Ribe around AD865. Denmark officially became a Christian country around the year AD965 when Harald Bluetooth announced his deed on the Jelling stone (see below). It now seems possible that 100 years before this countrywide conversion, Christian Danish Vikings were living, dying and being buried in Ribe. In the excavations conducted by the Southwest Jutland Museums between 2008-2012 around the Domskirke, the archaeologists found over 70 burials from the earliest period of activity. The tombs provide a unique insight into the early Christian burial customs, and have become be a major source of debate in Denmark. Culture Minister Ed Vaizey is supporting a campaign for a history trail through a new housing estate. Archaeologists discovered hunter-gatherers lived on the site of the Great Western Park development in Didcot, Oxfordshire, 9,000 years ago. About 3,300 homes, schools and shops are being built on the 180-hectare site east of the town. A petition in favour of installing a history trail has been signed by nearly 1,100 people. The Didcot Dogmile group wants the archaeology found at the site marked and displayed through a trail with information boards and a reconstruction of an Iron Age roundhouse. An international team of researchers have discovered a ‘microbial Pompeii’ preserved on the teeth of skeletons around 1,000 years old. The key to the discovery is the dental calculus (plaque) which preserves bacteria and microscopic particles of food on the surfaces of teeth, effectively creating a mineral tomb for microbiomes. The research team discovered that the ancient human oral cavity carries numerous opportunistic pathogens and that periodontal disease is caused by the same bacteria today as in the past, despite major changes in human diet and hygiene. The researchers discovered that the ancient human oral microbiome already contained the basic genetic machinery for antibiotic resistance more than eight centuries before the invention of the first therapeutic antibiotics in the 1940s. 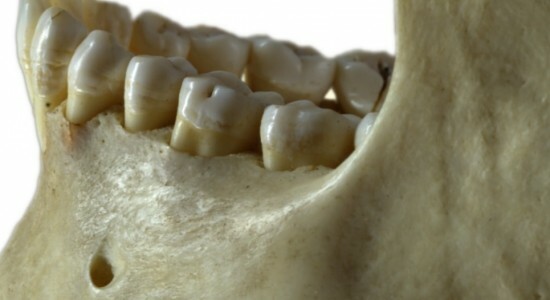 As well as health information, the scientists recovered dietary DNA from ancient dental calculus, allowing the identification of dietary components, such as vegetables, that leave few traces in the archaeological record. Gold, Silber, Schmuck: In der Südpfalz hat ein Raubgräber einen Schatz aus der Spätantike entdeckt. Vermutlich hatten plündernde Germanen im fünften Jahrhundert die Kostbarkeiten an der einstigen Römerstraße hastig verscharrt. Ein Raubgräber hat in Rheinland-Pfalz einen nach Expertenangaben bundesweit einmaligen Schatz mit Gold und Silber aus dem fünften Jahrhundert entdeckt. Archäologen präsentierten am Dienstag in Mainz unter anderem goldene Schmuckstücke eines zeremoniellen Gewands, einen Silberteller, eine Silberschale sowie Reste eines vergoldeten und versilberten Klappstuhls. Der Wert des Schatzes, der den Angaben zufolge aus spätrömischer Zeit stammen soll, wird auf weit mehr als eine Million Euro geschätzt. Der Schatz dürfte einem sehr hohen Beamten oder einem Fürsten aus dem fünften Jahrhundert gehört haben, meint Landesarchäologe Axel von Berg. Damals drangen plündernde Germanen ins Römische Reich ein, das sich bereits in Auflösung befand. Laut von Berg sollten die Gegenstände die politische Autorität einer hohen Persönlichkeit widerspiegeln. Were the ancient Greeks and Romans colour blind? Homer left historians with the impression that the ancient Greeks and Romans had an underdeveloped appreciation of colour. The ancients, in fact, were a shade more sophisticated than that and understood colour in a completely different way to us, argues Mark Bradley. People in ancient cultures saw colour in an altogether different way from you and me. The most famously perplexing description of colour in the ancient Mediterranean world is the 'wine-dark sea' in The Iliad and The Odyssey. Have you ever looked at the sea and thought that it was the colour of claret? One of the first people to argue that the ancient Greeks had an under-developed colour sense was a 19th century British prime minister. As well as being a politician, William Gladstone was a classics scholar and in his spare time did a study of colour usage in early Greek literature. A new study, published in the Journal of Archaeological Science, suggests that the site researchers had previously thought was the starting place of many of Stonehenge's rocks may not have been the source after all. Instead, it looks like the rocks actually come from a different site three kilometres away. The findings, bring into question the long-standing theory that people transported the rocks from Wales to Wiltshire in order to build the monument. The research focused on the smaller stones at Stonehenge, called bluestones. The chemistry of these rocks varies, but they all originate from the Preseli Hills in Wales and are thought to have been transported to the Stonehenge site over 4000 years ago. New research at The University of Texas MD Anderson Cancer Center in Houston has unearthed some of the ancient mysteries behind leprosy, also known as Hansen’s disease, which has plagued mankind throughout history. The new research findings are published in the current edition of journal PLOS Neglected Tropical Diseases. According to this new hypothesis, leprosy disease may well be the oldest human-specific infection, with roots that likely stem back millions of years. The PLOS NTG paper, entitled “On the Age of Leprosy” (doi/10.1371/journal.pntd.0002544) is co-authored bHanXYy Xiang Yang Han of the MD Anderson Center, and Francisco J. Silva of the Universitat de València’s Evolutionary Genetics Unit in Valencia, Spain. 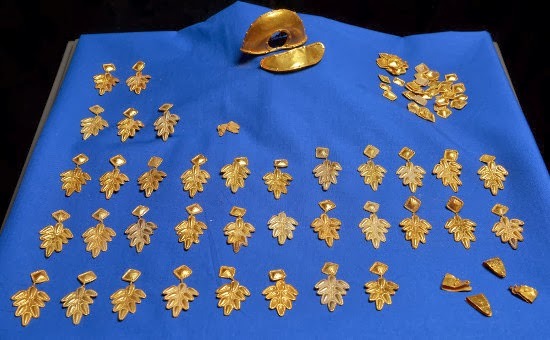 A hobby archaeologist with a metal detector has discovered a trove of gold and silver in a German forest dating back to late Roman times, fuelling speculation it could be the legendary Nibelung treasure that inspired Richard Wagner's opera cycle. The haul from the western state of Rhineland Palatinate, worth about 1 million euros, includes silver bowls, brooches and other jewelry from ceremonial robes and small statues that adorned a grand chair, said archaeologists. Robbed of its place in the annals of history by a series of earthquakes, the ancient city of Tralleis is set to regain some of its former glory with a number of restorations that are expected to bring in tourists. A team of archaeologists from Pre-Construct Archaeology carried out an excavation within the village of Haddenham in advance of the construction of a residential dwelling. 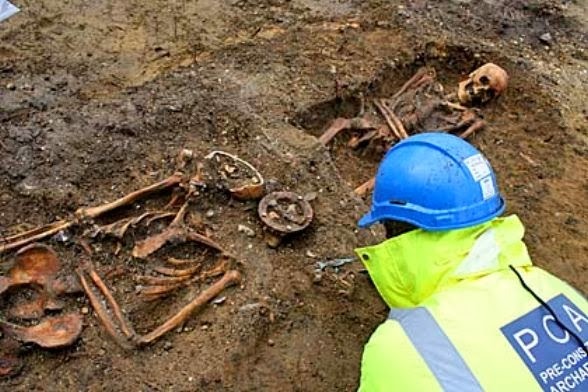 The dig uncovered burials dating to the Early Saxon period (6th century AD). Dozens of prehistoric burials have been discovered by archaeologists during excavations in Nowy Łowicz in the biggest Polish military training area near Drawsko Pomorskie in West Pomerania. The study leaders were Dr. Adam Cieśliński of the Institute of Archaeology of the University of Warsaw and Andrzej Kasprzak of the Museum in Koszalin. In the last three seasons, explored graves were mostly cremation graves of the Lusatian culture communities of the Bronze Age, from before 3 thousand years. Their number reaches 90. Last year, archaeologists found nearly 30 burials. 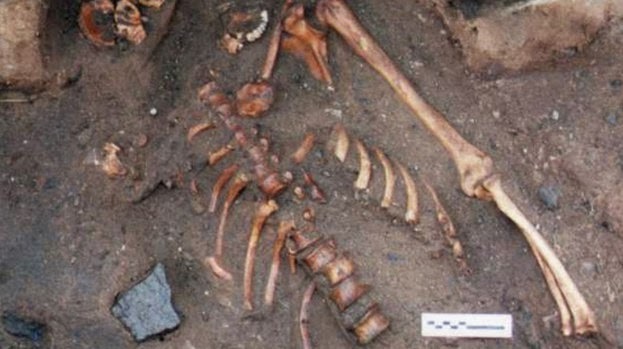 The skeleton of a young man dating from the 12th or 13th centuries, who was stabbed to death has been discovered during an archaeological dig in East Lothian. The remains of the corpse were found during an excavation at the Scottish Seabird Centre in North Berwick. Examination of the skeleton revealed the man had been fatally stabbed four times in the back, twice in the left shoulder and twice in the ribs. The High Speed 2 rail project linking London to Birmingham will threaten more ancient woods than previously thought, with almost 50 at risk, campaigners have warned. The most up-to-date maps for the project’s first phase show that the number destined to be lost or damaged stands at 49, according to the Woodland Trust, compared with an official estimate of 19. The charity had previously claimed that 43 ancient woodlands – areas that have been wooded continuously since 1600 – were threatened by the project, but has increased the figure in light of updated plans published last month. The area thought to be at risk covers thousands of acres and is regarded by campaigners as vital habitat for dozens of animal species including birds, bats and butterflies. Today sees the launch of Lost Change, an innovative and experimental application that allows coins found within England and Wales and recorded through the British Museum’s Portable Antiquities Scheme (PAS), to be visualised on an interactive, dual-mapping interface. This tool enables people to interrogate a huge dataset (over 300,000 coin records can be manipulated) and discover links between coins’ place of origin (the issuing mint or a more vague attribution if this location is uncertain) and where they were discovered and then subsequently reported to the PAS Finds Liaison Officers. While much of the the data is made available for re-use on the PAS website under a Creative Commons licence, some details are closely guarded to prevent illicit activity (for example night-hawking or detecting without landowner permission) and so this application has been developed with these restrictions in mind. An object’s coordinates are only mapped to an Ordnance Survey four-figure National Grid Reference (which equates to a point within a 1km square), and only if the landowner or finder has not requested these to be hidden from the public. Wikinger liebten Geheimcodes. Einige sind schon lange bekannt, andere stellen Runologen immer noch vor Rätsel. Dem Linguisten Jonas Nordby von der Universität Oslo ist es jetzt gelungen, mit dem Jötunvillur Code eine weitere Geheimschrift zu knacken. Codierte Botschaften müssen nicht immer erhabenen Inhalts sein. Bei weitem nicht jeder Geheimcode verrät ein Schatzversteck oder Ort und Datum eines militärischen Manövers. Die allermeisten Botschaften, die in einer Geheimschrift verfasst werden, sollen vor allem eins: Spaß machen. Wahrscheinlich hat jeder in der Schule seinem besten Freund Zettel zugesteckt, auf denen er ihn in Kalle Blomquists Räubersprache zum "totrorefoffofenon umom einonson" aufgefordert hat. Oder in der Löffelsprache um ein "treleweffelewen ulewum eileweins" gebeten? Was würde ein Archäologe der Zukunft mit einem dieser Zettel anfangen? 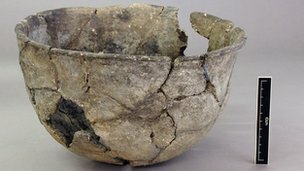 Human remains dug up from an ancient grave in Oxfordshire add to a growing body of evidence that Britain's fifth-century transition from Roman to Anglo-Saxon was cultural rather than bloody. The traditional historical narrative is one of brutal conquest, with invaders from the North wiping out and replacing the pre-existing population. But a new study, published in the Journal of Archaeological Science, hints at a more peaceful process. Dr Andrew Millard, from Durham University, is one of the study's authors. A new app is giving visitors to Windsor Castle's an enhanced experience of Capturing the Castle: Watercolours of Windsor by Paul and Thomas Sandby, a new exhibition opening tomorrow. Aimer Media created an app with Royal Collection Trust to support the Capturing the Castle exhibition at Windsor Castle, featuring the watercolours of Paul and Thomas Sandby. Capturing Windsor Castle helps you get the most from the exhibition at Windsor Castle from 7 February - 5 May. Download the free iOS app to see forty-five of Sandby's finest views of Windsor Castle and town, paired with photographs of the same views as they appear today. With retina-quality images of the watercolours at your fingertips, all helpfully geo-located, users can navigate around the different views during, and after, their visit. The mystery of a 900-year-old Viking message has finally been solved. Cryptologists, put down your cipher devices, because the formerly incomprehensible code that's been haunting your dreams reads in part: "Kiss me." A runic artifact that reads: "Kiss Me". Photographer: Jonas Nordby. The baffling Jötunvillur code, which dates back to as early as the 9th century, has popped up in over 80 different Norse inscriptions, puzzling runologists (those who study the Viking rune alphabets) for some time. That is, until Jonas Nordby, a runologist from the University of Oslo, valiantly broke the code, realizing a simple pattern amongst the writings. "For the jötunvillur code, one would replace the original runic character with the last sound of the rune name," he explained in an interview with Forskning.no. "For example, the rune for 'f', pronounced 'fe,' would be turned into an 'e,' while the rune for 'k,' pronounced 'kaun,' became 'n.'" The traditional historical narrative is one of brutal conquest, with invaders from the North wiping out and replacing the pre-existing population. But a new study, published in the Journal of Archaeological Science, hints at a more peaceful process. Dr Andrew Millard, from Durham University, is one of the study's authors. 'The main controversy over the years has centred on how many Anglo-Saxons came across the North Sea,' he says. Scotland’s hillforts are amongst the most visible ancient monuments in the landscape; they are often large, in very prominent locations and are both physically and intellectually accessible. The majority of these hillforts are recognised to be of national significance, yet most of them remain under researched. Researchers have securely dated a prehistoric human stone tool industry that is thought to have been used by early modern humans, or possibly late Neanderthals, around the time when early modern humans were beginning to emerge in Europe, arguably sometime between 40,000 to 50,000 years B.P. Scientists have long debated questions surrounding when the first modern humans entered Europe and what tools they first used upon entering. The Uluzzian, a prehistoric stone tool techno-tradition represented by lithic artifacts unearthed by archaeologists at cave locations primarily in Italy and Greece, has been a central contender as a possible "transitional" industry between the typical stone tool types (the Mousterian) used by late European Neanderthals and those (Aurignacian, Châtelperronian) of the earliest modern human newcomers to Europe. Why did Vikings sometimes use codes when they wrote in runes? Were the messages secret, or did they have other reasons for encrypting their runic texts? Researchers still don’t know for sure. But Runologist K. Jonas Nordby thinks he has made progress toward an answer. He has managed to crack a code called jötunvillur, which has baffled linguists and historians for years. His discovery can help researchers understand the purpose behind the mystery codes. A runic code called jötunvillur has finally been decrypted. It just might help solve the mystery of the Vikings’ secret codes. A BRONZE Age grave uncovered in the Highlands has revealed the remains of a woman in her forties who was suffering from toothache before she died 4,000 years ago. 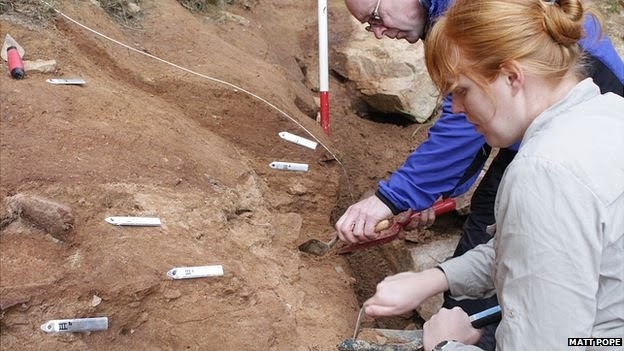 Archaeologists from Glasgow-based Guard Archaeology were called in when a cist – a stone burial chest – was inadvertently disturbed by construction workers during landscaping of an access track through Cullaird Wood in West Torbreck, south-west of Inverness. The team undertook a rescue excavation and found the human remains had been part of a burial. Osteoarchaeologist Maureen Kilpatrick analysed the bones and discovered that they belonged to a woman aged between 40 and 44. The change by our ancestors from hunter-gathers to farmers is one of the most intensively researched aspects of archaeology. 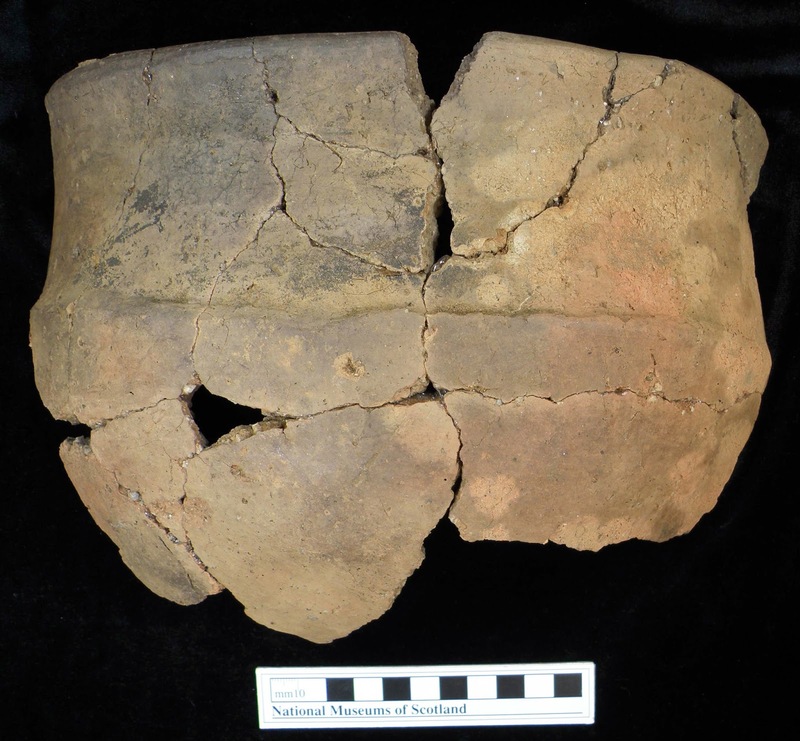 Now a large-scale investigation of British archaeological sites dating from around 4,600 BC to 1,400 AD has examined millions of fragments of bone and analysed over 1,000 cooking pots. The team, led by Professor Richard Evershed of the University of Bristol's School of Chemistry, developed new techniques in an effort to identify fish oils in the pots. Remarkably, they showed that more than 99 per cent of the earliest farmer's cooking pots lacked sea food residues. THE SKELETON of a small Bronze Age man with worn-away teeth was today removed from his grave a metre beneath a primary school playground. 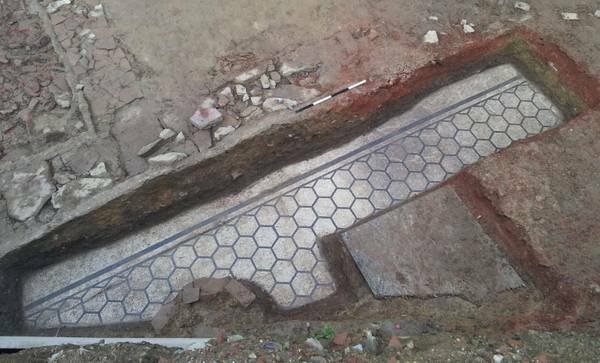 The 4000-year-old remains were found by archaeologists surveying Victoria Primary School in Newhaven, Edinburgh, ahead of a proposed school extension. The archaeologists stumbled upon the well-preserved bones in late January while looking for evidence of the village’s medieval harbour. The body was curled up in a foetal position common in the Bronze Age, and positioned alongside a pottery food or drink vessel to sustain them in the journey to the next world. Get email updates from this site! When was Britain first colonised by early humans? Was Charlemagne a Mass Murderer? Who Is Buried in Charlemagne’s Tomb? I am a freelance archaeologist and Fellow of the Society of Antiquaries and the Society of Antiquaries of Scotland specializing in the medieval period. I have worked as a field archaeologist for the Department of Environment (Northern Ireland) and the Museum of London. I have been involved in continuing education for many years and have taught for the University of Oxford Department for Continuing Education (OUDCE) and the Universities of London, Essex, Ulster, and the London College of the University of Notre Dame, and I was the Archaeological Consultant for Southwark Cathedral. I am the author of and tutor for an OUDCE online course on the Vikings, and the Programme Director and Academic Director for the Oxford Experience Summer School.